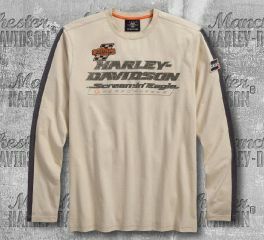 Men’s Long Sleeve T-shirts from Harley-Davidson. 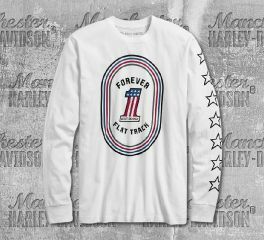 Shop for long sleeve graphic tee shirts, vintage tees, and long sleeve motorcycle t-shirts for men. 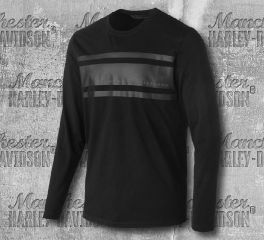 Harley-Davidson® Men's Colorblocked Long Sleeve Tee is made from 100% cotton interlock with specialty wash for variations in color and fading. This long sleeve tee is perfect with jeans or cargoes. 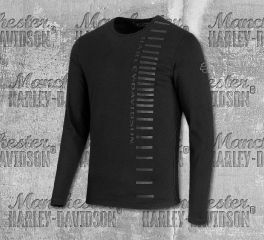 Harley-Davidson® Men's Performance Long Sleeve Tee with Coolcore Technology is made from 100% polyester Coolcore jersey. 100% polyester mesh panels. Coolcore fabric wicks moisture from the body for year-round comfort through thermal regulation. 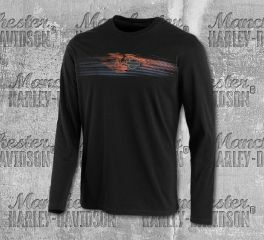 Harley-Davidson® Men's Engine Print Slim Fit Long Sleeve Tee is made from 100% cotton jersey. It features a high-density graphics. This long sleeve tee is slim fit that fits closer to the body. 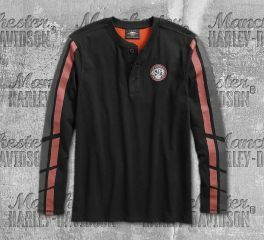 Harley-Davidson® Men's No. 1 Flat Track Slim Fit Long Sleeve Tee is made from 100% cotton jersey. It features a printed graphics on front, and on the left sleeve. Slim fit-fits closer to the body. 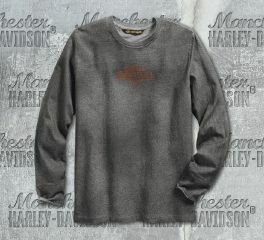 Harley-Davidson® Men's Retro Race Flag Slim Fit Henley Long Sleeve Tee is made from 100% cotton slub jersey. It features a button placket closure, printed graphics, rib knit neckline and cuffs. Slim fit-fits closer to the body. 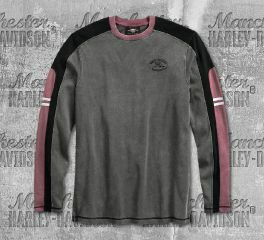 Harley-Davidson® Men's High Density Print Long Sleeve Slim Fit Tee is made from 100% cotton jersey. Rib-knit neckline. Printed and high-density graphics. Slim Fit—fits closer to the body. 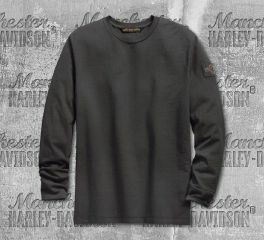 Harley-Davidson® Men's Triangle Logo Slim Fit Long Sleeve Tee is made from 100% cotton jersey. It features printed graphics on both sleeves, and on left chest. Rib-knit neckline and cuffs, and slim fit that fits closer in the body. 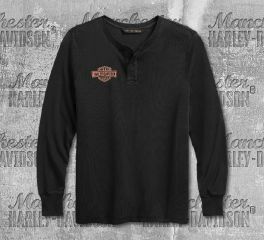 Harley-Davidson® Men's Henley Laser Cut Graphic Long Sleeve Tee is made from 100% cotton washed for softness. Garment dyed with enzyme and pigment spray for faded look. Rib-knit neckline and cuffs. Button placket. Laser-cut jersey applique. Slim Fit—fits closer to the body. 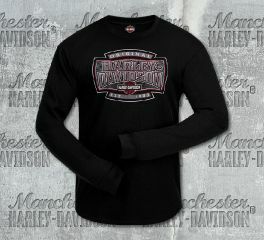 Harley-Davidson® Men's H-D® Shield Black Long Sleeve Tee is made from 50% cotton and 50% polyester. 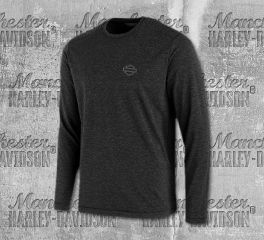 This long sleeve tee features a H-D® shield graphics printed on front, and finished with our exclusive Manchester Harley-Davidson® New Goals dealer backprint. The track-inspired Screamin' Eagle® Sleeve Stripe Tee is cut from soft cotton jersey for total comfort. The heavy enzyme wash gives this men's long sleeve shirt a real workout. The result? A lived-in feel at the first wear. Distressed stripes and graphics pump up the sporty look. Our designers infuse the classic button henley with bold stripes to deliver an aggressive look. Try the Dual Stripe Henley with jeans. This men's long-sleeve shirt also pairs well with cargoes and a favorite hoodie. Design Details: Rib-knit neckline. Contrasting inner yoke. Printed stripes. Keep comfortable during the ride with the Jersey Slub Knit Henley. The marled-like all-cotton fabric is washed for subtle color variation that adds to the casual look of this men's long sleeve shirt. We scrap the traditional button placket for snaps to lend a rugged vibe. 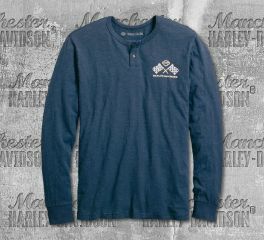 Materials: 100% cotton slub jersey with specialty wash for subtle high-and-low variations in color. Insulating hollow-core yarn is the secret behind this lightweight, breathable men's long sleeve shirt. The high-quality merino wool blend upgrades this one from standard tee to stylish layer. The heather black Merino Wool Hollow Yarn Slim Fit Tee incorporates subtle moto-inspired shoulder stitching and sleek high-density graphics. Stay Warm: Hollow-core yarn traps air to improve insulation without adding weight or bulk. Materials: 86% polyester, 9% merino wool, 5% spandex. Design Details: Moto stitching detail on shoulders. Understated but never under styled. The Chest Stripe Slim Fit Tee captures the race spirit with three simple horizontal stripes and our name. We challenge you to find a more perfect men's long sleeve shirt. Graphics: Printed stripes and high-density graphics. 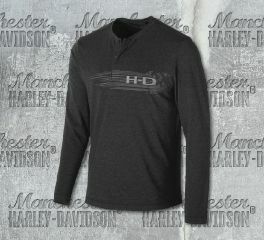 Comfort fuses with style in our H-D® Racing Henley. Thanks to the soft, cotton jersey, this men's long sleeve shirt enjoys a laidback vibe. Contrasting placket, patches, and bold embroidery take inspiration from racing graphics. Design Details: Rib-knit neckline. Contrasting inner placket lining. Graphics: Embroidered graphics and patches. The Washed Waffle Knit Slim Fit Henley. Everything you need to know about this soon-to-be favorite is in the name. The washed treatment delivers instant vintage look. 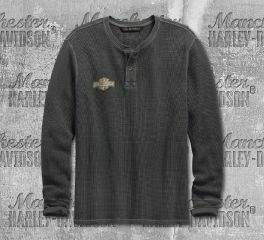 The soft waffle knit and button placket are classic henley details from way back. And the slim cut keeps this men's long sleeve shirt looking trim—never oversized or baggy. Iconic Bar & Shield logo graphics appear in a two-tone print. Design Details: Washed for softness. Garment dyed with pigment spray for washed-down look. Rib-knit neckline and cuffs. The comfortable Discharge Print Slim Fit Tee offers washed-down cotton construction with a subtle fade for authentic wear. Graphics? Raw-edge sleeve patch and big art on back of this men's long sleeve shirt. Design Details: Washed for softness. Garment dyed with pigment spray for washed-down look and subtle variations in color and fading. Rib-knit neckline. Graphics: Raw-edge printed patch on sleeve. Discharge printed graphics on back. A base layer that elevates your riding experience. The FXRG® Base Layer Tee features innovative fabric construction that works to monitor warmth, coolness, odor, and moisture wicking for comfort in all kinds of weather conditions. This lightweight men's performance shirt fits smoothly under riding gear. And because the fabric flexes as you move, it won't bulk, bunch, or stretch out. With this much innovation and technology, this tee is a serious upgrade from the thermal underwear bunched up in your underwear drawer. Time to upgrade—check out the specs for more. Stay Cool: High-performance fabric offers effective moisture management to cool when you sweat and warm when you're cold. Stay Warm: Lightweight construction helps retain body warmth. Iso-Pads spaced across the shoulders hold warmth to protect against chill. Stay Comfortable: Designed to wick moisture away through Sweat Traps under the arms. Skin Nodor technology helps prevent odor by inhibiting bacterial growth. Enhanced Riding Performance: The Air-Condition Channel with Zero-Insulation combined with the AirGuide cools the body and allows excess warmth to escape for the most efficient regulation of body temp and the most comfortable ride. Excellent Fit: Close-fitting without constricting, this layer features Fitting Ribs on the sides and Expansion Ribs at the elbows to adjust when in a riding position without compromising functional and temp-regulating properties. Graphics: Knit-in Bar & Shield logo. The unique fabric treatment delivers color variation on the Harley-Davidson® Men's Fast Track Laser Cut Slim Fit Long Sleeve Tee for a broken-in look. Precise laser-printed graphics are overprinted on this men's long sleeve shirt for weathered art. 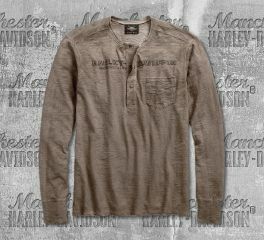 It may look like a traditional henley, but this men's long sleeve shirt is powered with a secret weapon for comfort. It's thanks to the lightweight hollow-core yarn that traps air for breathable, insulation. A hidden button placket and low-key graphics finish the sleek look of the Merino Wool Blend Slim Fit Henley. Graphics: High-density and printed graphics.